Originated on the Patterson vertical-turbine pump design, the Patterson Multi-Purpose Vertical Turbine (MPVT) pump is suitable for service in clean water, raw water, and wastewater (and other solids-laden flows). 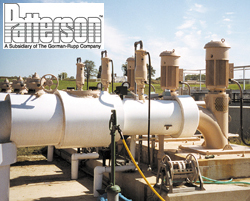 Patterson Multi-Purpose Vertical Turbine pumps are specifically designed to handle the stringy solids that clog other pumps. Patterson Multi-Purpose Vertical Turbine pumps are excellent choices for easy retrofitting of existing submersible pumps. By moving the motor out of the wetwell and separating it from the pump, the Patterson Multi-Purpose Vertical Turbine pump can deliver more reliable service and easier maintenance than comparable submersible pump stations. Patterson Multi-Purpose Vertical Turbine pumps have enclosed line shafts to protect the working mechanism from damage. For more information on the Patterson Multi-Purpose Vertical Turbine pump, please use our request form.